Yorkshire Water has launched it’s 2019 integrated blockages campaign by challenging hotspot areas to become blockage free. 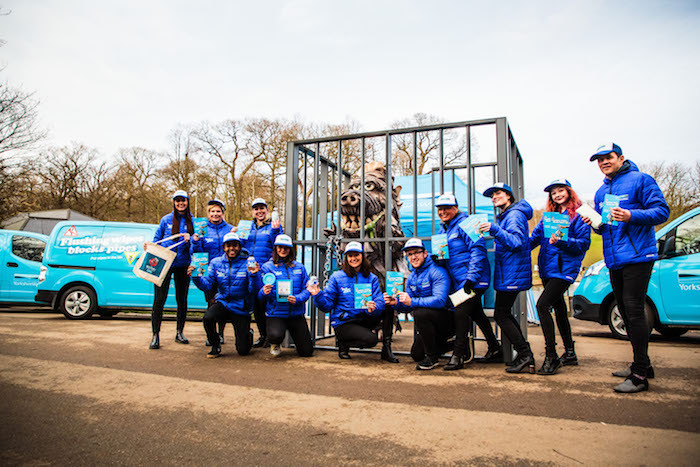 The campaign consists of outdoor and social advertising, a fleet of community engagement teams, interactive experiential events, an eight-foot-tall ‘Wipesaur’ and a community fund of £40,000 for the hotspot area that that has the lowest number of blockages during the campaign. Yorkshire Water has identified postcode zones in Leeds, Wakefield, Sheffield and Huddersfield that experience the highest number of blockages caused by wet wipes, up to eight times more than the regional average. As a consequence, as well as launching the campaign and setting up the community fund, the firm is taking action to clean miles of sewers in each of these areas to try and keep them blockage-free. The campaign focusses on experiential marketing within each of the targeted communities, creating an opportunity for meaningful conversations, but is also backed by outdoor and social advertising that concentrates on delivering consistent messaging in the hotspot areas. It is also encouraging residents in these hotspots to act themselves by setting up a month-long ‘Blockage Free Challenge’. The postcode zone that records the fewest sewer blockages during the challenge will secure the entire £40,000 community funding pot for its area.